Photographer Harry Cory Wright explores our fundamental attraction to place, and the very physical process of being in landscape. His photographs range from the intimate nature of his father’s bench beside a stream to the stark grandeur of the rock face on the island of Staffa. In his 2006 series ‘Journey Through the British Isles’ he travelled extensively across Britain documenting and celebrating the splendour of the countryside. He is regularly referred to as one of the UK’s leading landscape photographers. Cory Wright uses a 10 x 8 inch wooden Gandolfi plate camera to produce negatives of immense clarity. The process of taking the picture is slow, often contemplative. Harry talks often about the level of engagement afforded by the big camera. His printers in London, Bayeux, work closely with him to create the initial prints which start to reveal the information from the negative. Grieger, in Germany, then enlarge the photographs and it is at this point that the incredible level of detail really starts to appear. Harry Cory Wright was born in 1963 and lives and works in Norfolk. 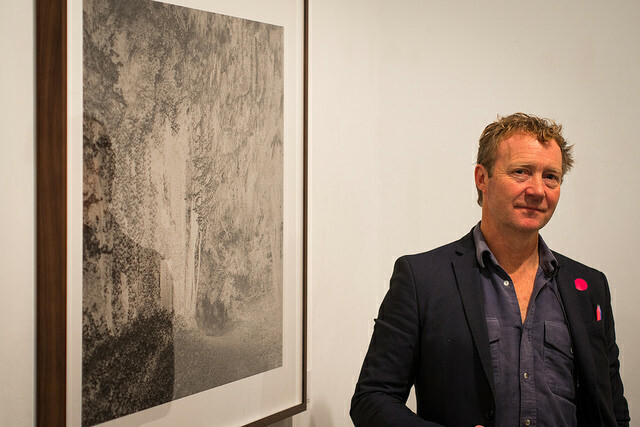 His work was included in Landmark: The Fields of Photography at Somerset House, London (2013) curated by William A. Ewing. Solo exhibitions include Hey Charlie, Eleven (2013), Place in Mind, Eleven (2011), and Journey Through the British Isles (2007). For further information on Anglia or other forthcoming exhibitions please contact ‘Eleven’, Eccleston Street, London. I want to infuse landscape with prospect, with visions of what may come. Made from centuries of human endeavour, each place transcends, becoming something intriguing, modern and full of potential. Often photography represents the natural as something detached from human activity, exploring the ‘wilderness’ separately from human endeavor. But when we get it right we are part of nature and this interaction is a very positive thing to be celebrated. It’s something worth striving for as an artist and, indeed, the art world as a whole. If we’re not positive, we’re doomed. Very often one is quite singular as an artist. It’s one opinion, one vision, all be it championing something to the outside world. Under the umbrella of Human Nature, we’re able to provide a feeling of cohesive quality with a diverse approach to one theme. There’s nothing better for perhaps a rather pastoral photographer to share a space with an urban street artist. That’s as good as it gets.